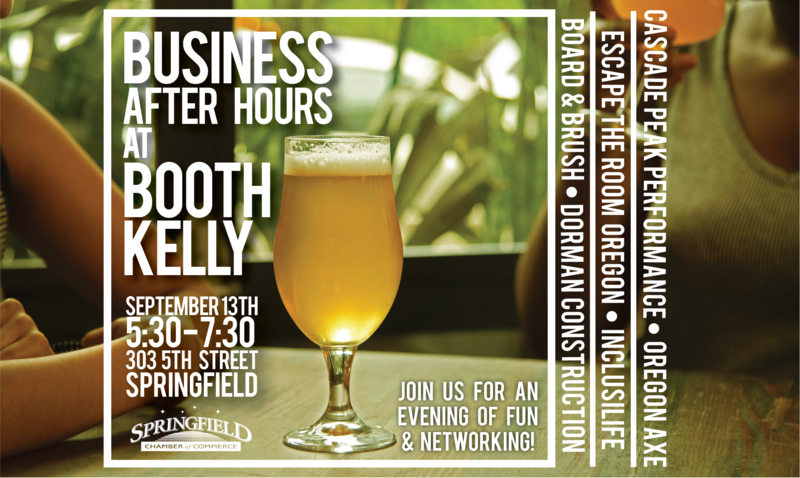 Join us Thursday, September 13th as Booth Kelly businesses open their doors to host Business After Hours. Come mingle with fellow Chamber members and business colleagues, and check out what amazing products and experiences Board and Brush, Urban Lumber, Escape the Room Oregon, Oregon Axe, Dorman Construction, Cascade Peak Performance, and Inclusilife have to offer! BUSINESS AFTER HOURS (BAH) is a quarterly event designed to provide a relaxed, informal get-together of Chamber business members after regular business hours. Over the past years, the BAH events have been held at various locations in cooperation with Chamber members. In addition to meeting and sharing ideas with prospective clients, members, and customers, this event offers a great opportunity for making new contacts and expanding your network! Marketing tables can be purchased for the fee of $50, if you are interested, please contact Judy. Cancelation Policy: Chamber event reservations must be canceled at least 24 hours prior to the event for a refund. Reservations not kept or canceled less than 24 hours prior, will not be eligible for a refund, or will be billed if they have not been paid. Please call with any questions regarding the cancelation policy. Thank you for your consideration.